Blog after blog. Journal after journal. Why aren't people listening? Here is the most important concept in all of selling (boiling the entire ocean): People tend to do whats in their own best interest. That's it. There's nothing more to it. Well, actually, everything you do or say comes after it. 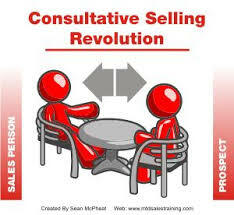 The sales industry calls this Consultative Selling. It's been around for 45 years or more. There are giant sales training/methodology courses teaching the full 360 degree view of this simple concept. For some reason(s) (keep reading), salespeople still do not take the time to learn and master this approach. Let me put in another way. There's no trick. There's no gimmick. There's no closing technique. There's no political component to it. All sales are made by a person or people who are looking out for what's in their best interest (hopefully that is also in the best interest of your customer's business as well, but that topic is for another day). Every time you try to add to this, turn it around, "disrupt it," remodel it or shine-it-up, it will backfire. We have all experienced this as a customer buying something of consequence. Today, I read for an hour on the web about salespeople's challenges and what their company wants them to say or track. Here's how to evaluate anything your company asks you to do: Is what they are asking in your best interest and the best interest of your company? If it is, then do it. If it's not, say something about it with a suggestion on how we can get back to the core principle of selling. "Bob, you and I have talked about the products/services that my company offers (or I offer). Today, let's put that aside and talk about you and your business/organization. Why do your customers choose you? What are things that you really want to accomplish? How does the business really operate?" Stop being "disruptive," because some manufacturer or trendy blog post told you to. This goes back to how we operate as human beings. Want more. Buy my book on Amazon. If you have Amazon Prime, it's a free download. Maybe they are new. Nobody has taught them this. It must be learned by others. Then practiced (which leads to the next one). People are lazy. They don't like change. They don't want to practice. They accept mediocrity. Their ego is so big, they can't even hear you. This makes up about 98% of salespeople. What are you going to do about it?